I've started by stamping down the sentiment first with Ranger Archival Black Ink because it's waterproof and I used it for the flowers as well. That's all really :) I've coloured the flowers with my Prima Watercolours and added some stickles to the flowers to add some shine and glitter to them. 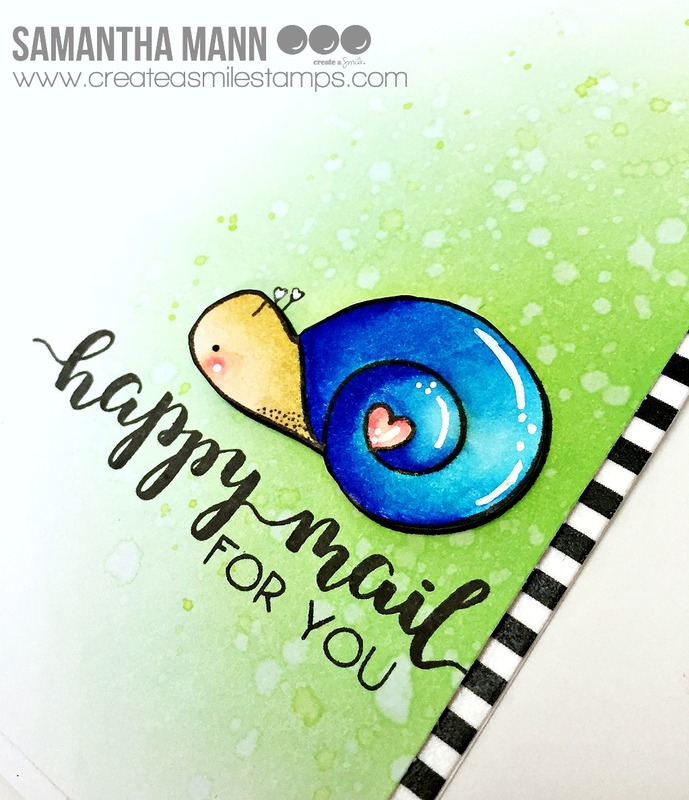 Happy Snail Mail for You! Samantha here with you on this lovely Friday! Today I have a quick little card to share with someone who needs a pick me up! I just think that little snail is SO cute! And I love that there are two different sized snails available! I was originaly going to use both, but ended up just going with the largest sized snail! Join me as we make this card! Raise your hand if you love one layer cards?! Not me...by far!! I think they're gorgeous, but I have the hardest time with them!! 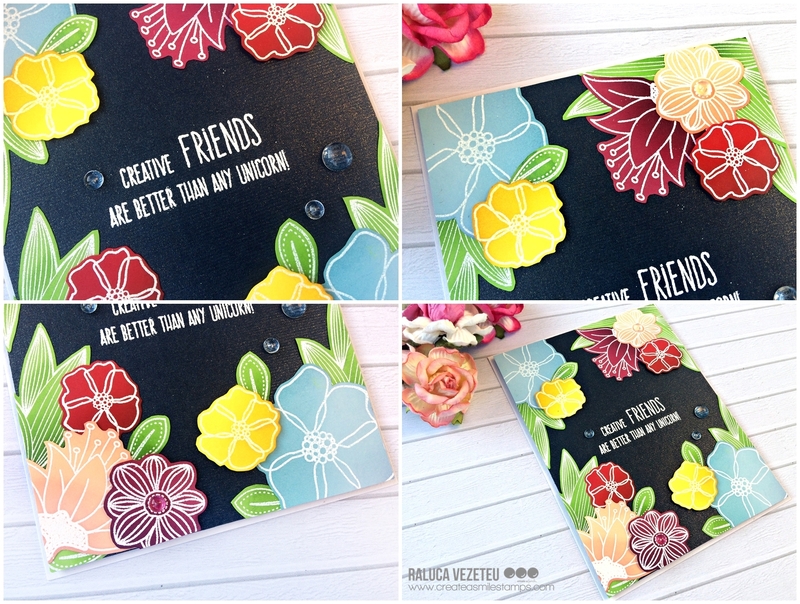 If you do love one layer cards, this could EASILY be remade as a one layer! How adorable is that cute little snail?! He's from the Lovely Critters stamp set! 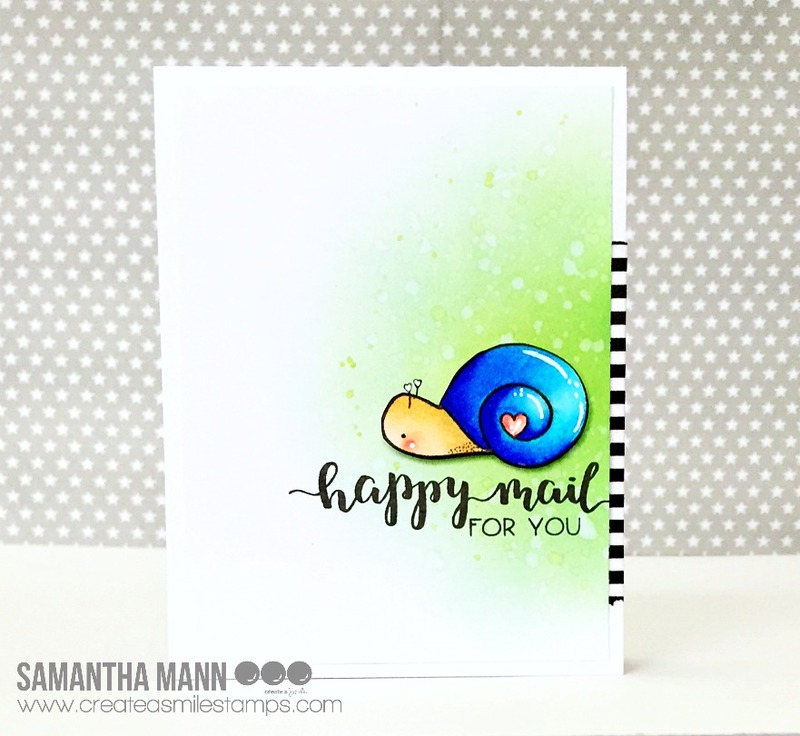 And the first part of the sentiment is from the Happy Mail mini stamp set! I finished off the sentiment with the Mini Birthday set! All of the Create a Smile Christmas themed stamps are on sale!!! Get them while you can! Hi there it's Anja agian with aonther card for you today. I really love the inlaid diecutting technique and wanted to combine it with a technique I saw over at Jennifer mcquire's blog. A great way to use those word dies and those lovely leftovers from different patterned papers. First I cut different widths of patterned papers and adhered them to a thin piece of paper. I placed the word dies and run them trough my cutting machine. Carefully removed them and cut the words out of some white cardstock. Placed some doublesided tape at the back of the panel thus making it easy to place the words and the little leftovers back in place. I went for a white cardbase and embossed the rectangle die. Adhered the panel and stamped the little elephant and copic colored it. Fuzzy cut the image and traced it with a black pen. adhered it to the card and used the stencil to give the background some extra interest with colors matching the used papers. Double stitched rectangle dies, tiny sentiments. We are almost back in bussiness so stay tuned for some news in August. Meanwhile show us your creativity with all the lovely supplies from Create a Smile. Hey all! I actually thought of making another round of Shaker Cards but I got distracted with another plan. But I hope you'll still enjoy this card as much as I do. So, I've started by making a little die-cut with the tag/banner shaped die with another piece of watercolour paper. I used this die-cut paper to make a little "window" for my flowers. I've stamped the same flowers multiple times and heat embossed them in White. Everytime I stamp, I hover back the die-cut piece to see which space is still empty. I then use my prima watercolours to colour in the flowers. For the sentiment, I used the Alphabet sticker but because I ran out of the black ones, I just used a light colour and use a black marker to colour the alphabets and then gloss it with Glossy Accent. 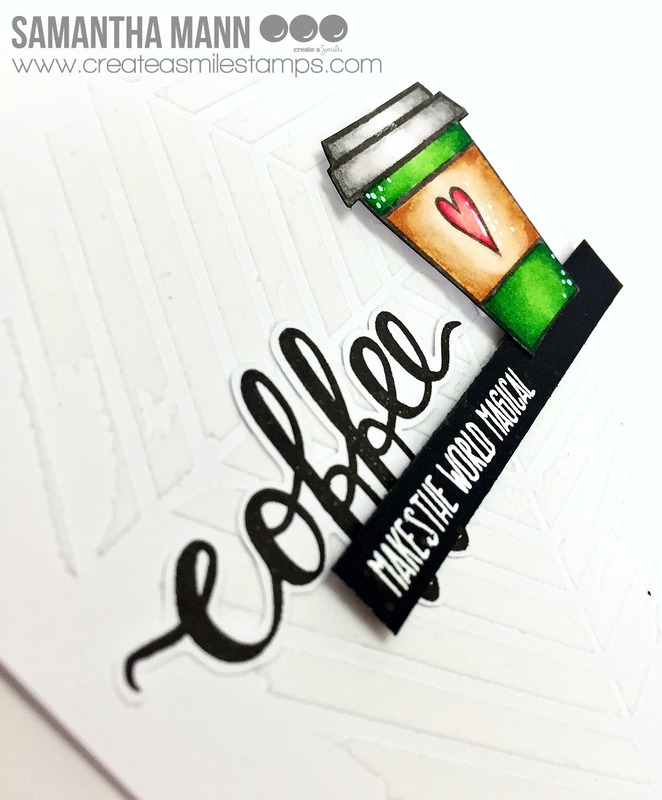 Samantha here, and today I'm sharing a card for all you coffee lovers! I really LOVE the look of a big scripty title paired with a more block-like font! So combining these two stamp sets was a no brainer! Here's a little secret, I don't like coffee myself, but SO MANY of my friends do! So let's make this for your favorite coffee-loving friend! 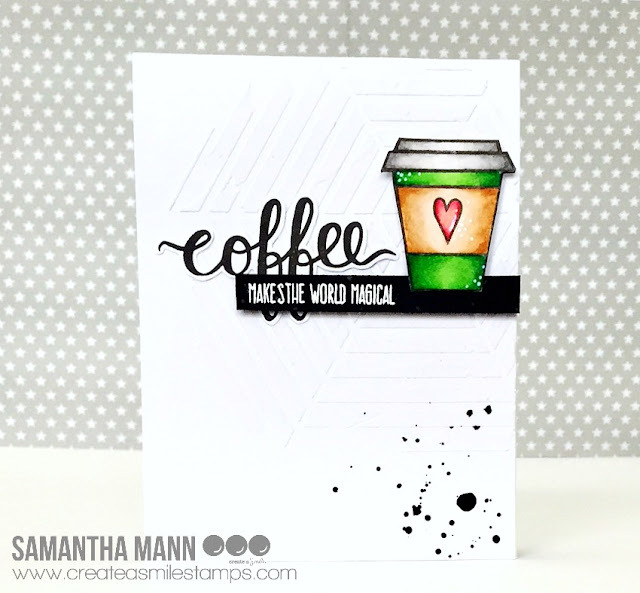 You can totally customize the coffee cup image with different colors to change up the feel of the card!! I went with a Starbucks inspired cup, myself! I used the Hexagon Web Stencil to add the white on white, subtle texture to the background! For the 'magical' part of the sentiment, I used the Friends Like You stamp set! Then used Coffee First for the large word and image! 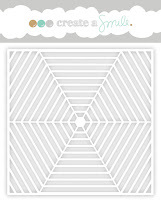 Create a Smile Stamps Owner and Illustrator Christine also started a movement called Smilespotting! It's a fun way to spread kindness and happiness to your community! Read all about it here! Creative Friends are the best! As I previously said in another post, I love to watch Laura Bassen's videos and I recently saw one with gorgeous, colorful flowers on a blue navy cardstock and I fell in love with it. So I decided to try to make one using different flower sets from Create a Smile. First, I die cut a blue navy panel using the largest stitched rectangle die and I stamped the sentiment in the center using VersaMark ink and white embossing powder. Next, I stamped in VersaMark and white heat embossed all the flowers and leaves on different colored cardstocks. This part was different than Laura Bassen's one cause she used solid stamps, so I tried to adapt mine using outline stamps. After I stamped and embossed the images I started fussy cut them with my scissors. Next, to give them the ombre look I added some Distress Inks using the ink blending technique. Then, after I arranged the elements on my card and I was happy with the placement, I glued some of them directly on the panel and I mounted a few using foam tape for a little dimension. Next, I cut off all the extra that was outside of my panel and I mounted it on a white card base. I added a few clear droplets and my card was done. And the most important thing, don't forget to GIVE CREDIT to the crafter who made the card that inspired you. And here is another card from me today. I hope you all have some great summery weather. Well if not maybe this card will help. I wanted to use the different "sea monsters" for my card today. You start with a topfolded white cardbase and diecut a panel out of another piece of white cardstock using the rectangle dies. In the background you stamp the seashell clingstamp with a light color. Stamp the different images three times on some copic friendly paper and color them. Fuzzy cut them and place them onto the card. 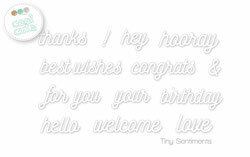 White heat emboss the sentiment onto some black cardstock and adhere it to the card. To finish of the card the shrimps get some clear wink of stella glitter and the yell fish gets google eyes. Underwater love and sending Sunshine kit. Please share your creations with us we love to see what you come up with. Hey guys! I've never been really good at making Shaker Cards but once in a while I like to give it a whirl. So today, I'm sharing you a bright and colourful shaker card. Firstly, I've die-cut the border first and then, colour it in yellow and pink. I've painted a very light wash of colour and when it's dry, I added more and more layer of the colours. This gives you various dimension of the yellow and pink without using different shades.